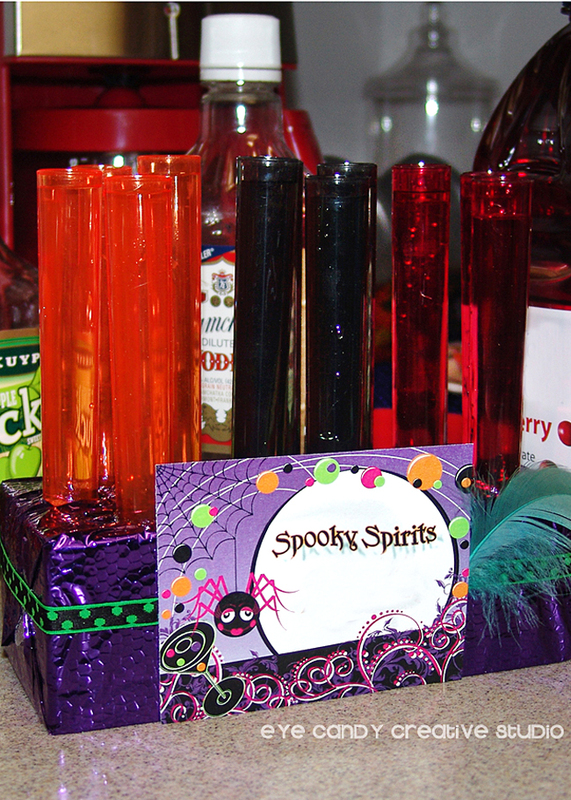 Halloween is almost here . . are YOU ready? 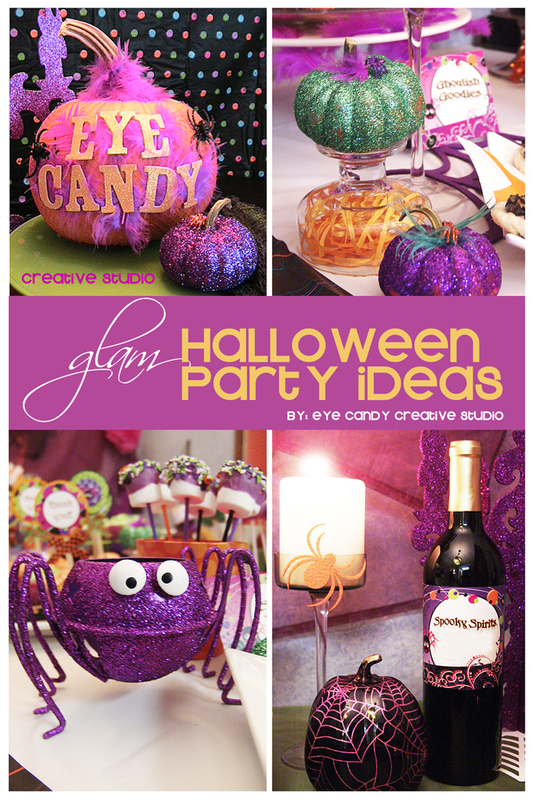 I wanted to share some ideas on how to have a fabulous Halloween get-together with some friends and (of course) I used the GLAM Halloween "Shock-tail" collection from my shop. There's still time to send out an invite - just pay, print, write in the info & send this week! Next is planning the decor! 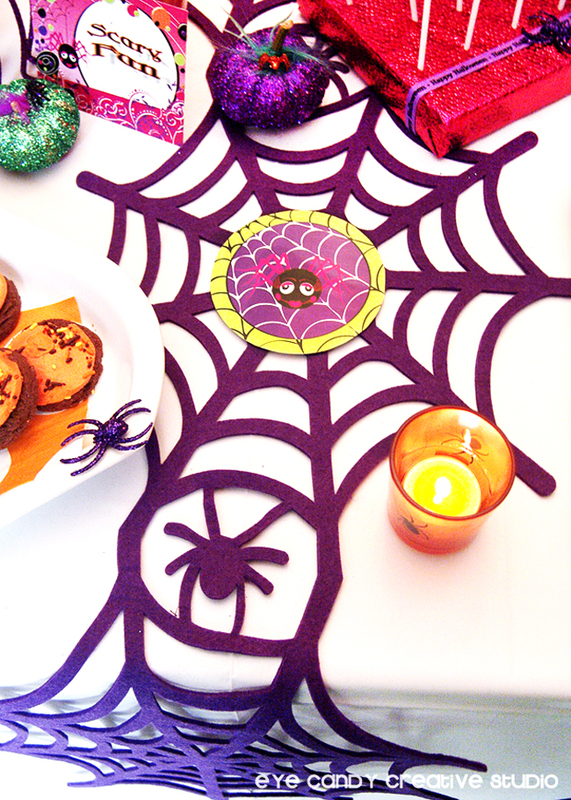 Some simple things you can do to dress up the party. 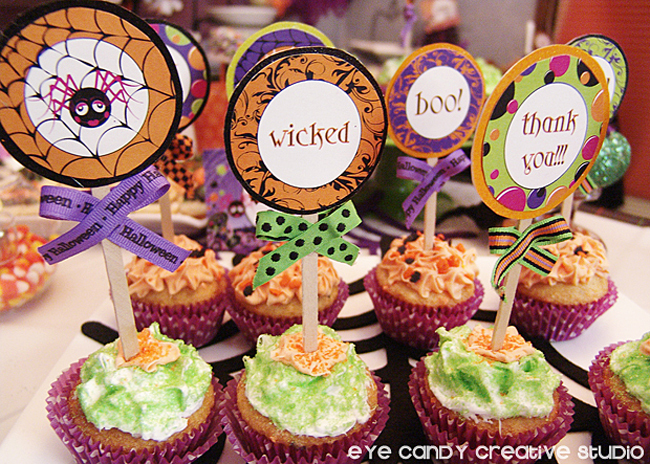 Use lots of decorated pumpkins. Grab some candles and try to use what you already have on hand. Plus you can use the artwork from the collection to create graphics to help with the decor too. 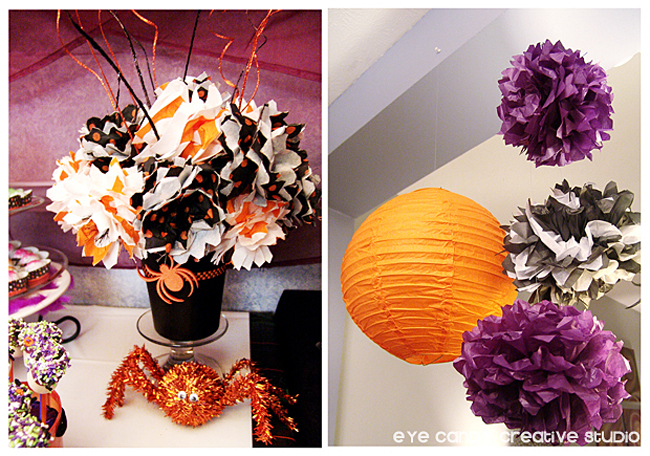 A few spiders that are fun add interest to your table along with the tissue pom bouquet, that I made. Some colored hanging tissue poms ALWAYS look good plus I added a paper lantern too to keep the color scheme throughout the decor. 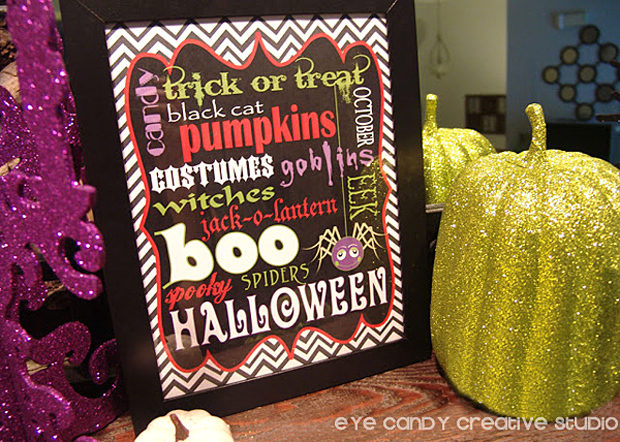 I made this FREE Chevron Halloween Subway Art that you can download for FREE here, put it in a frame & add some glitter pumpkins (found in the dollar bin at Target) to add an inexpensive display. 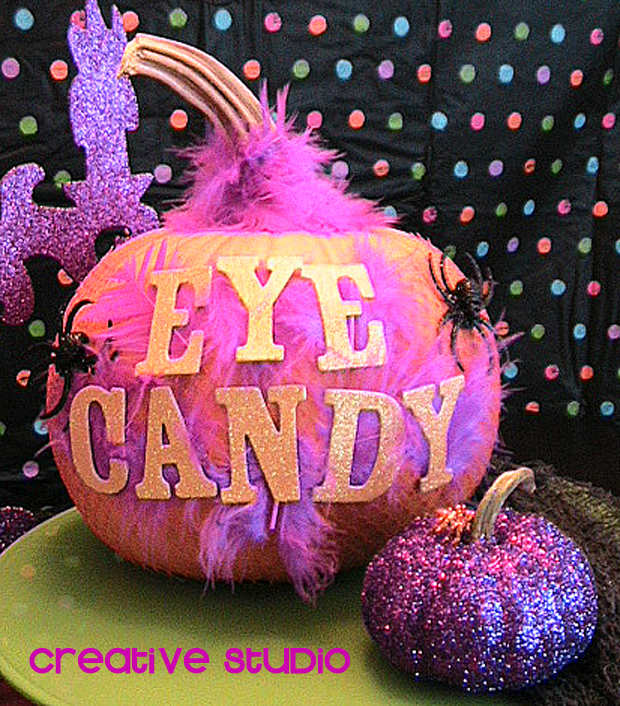 One of my favorite things to make for Halloween, that's inexpensive & looks good, is to get some mini pumpkins, spray adhesive on them & apply glitter. 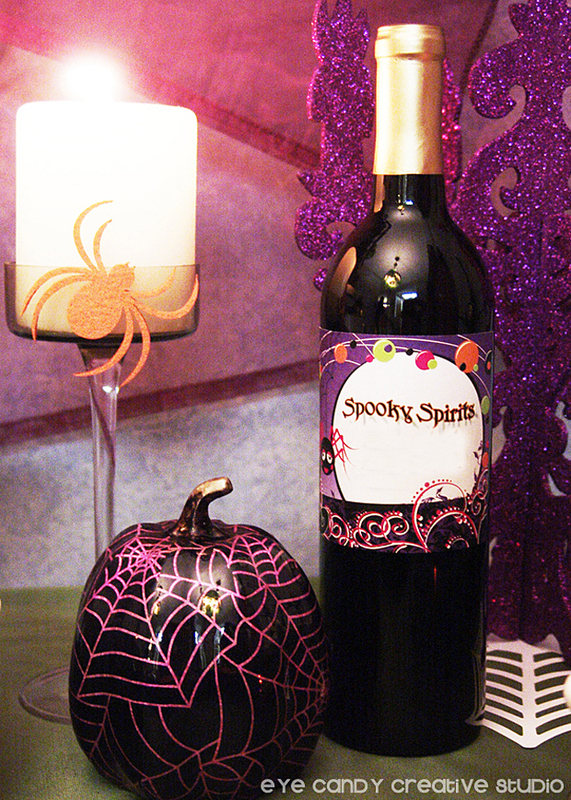 I went a step further here, & added a feather up near the stem along with a mini glitter spider. 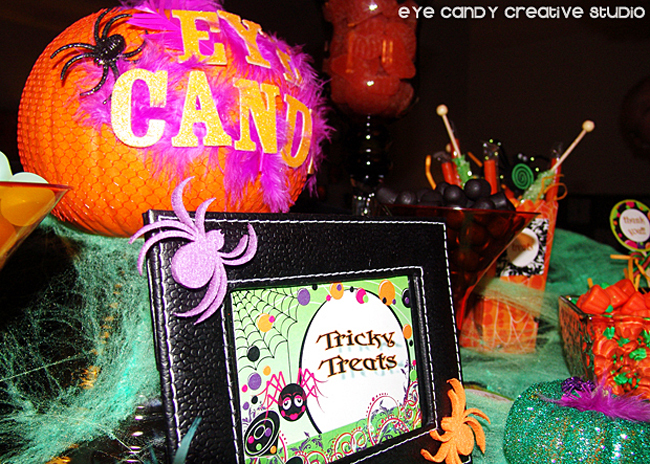 Every party has to have some sort of candy bar - especially at a Halloween party! 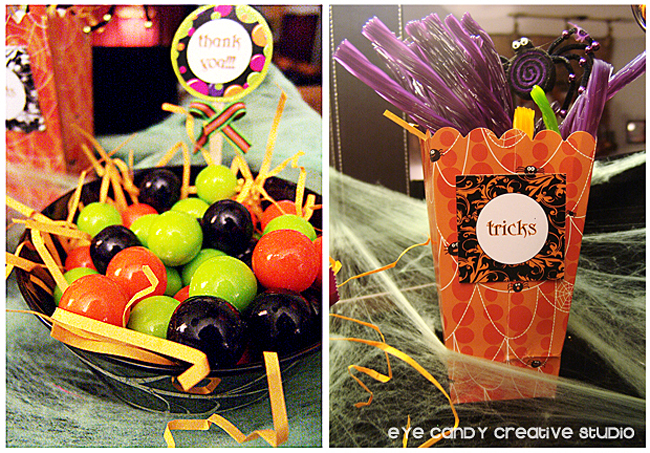 Keep it simple by throwing some fun colored web on a table & place some fun containers with some fave candy in for your guests to 'trick or treat' in! And the FOOD!!! . 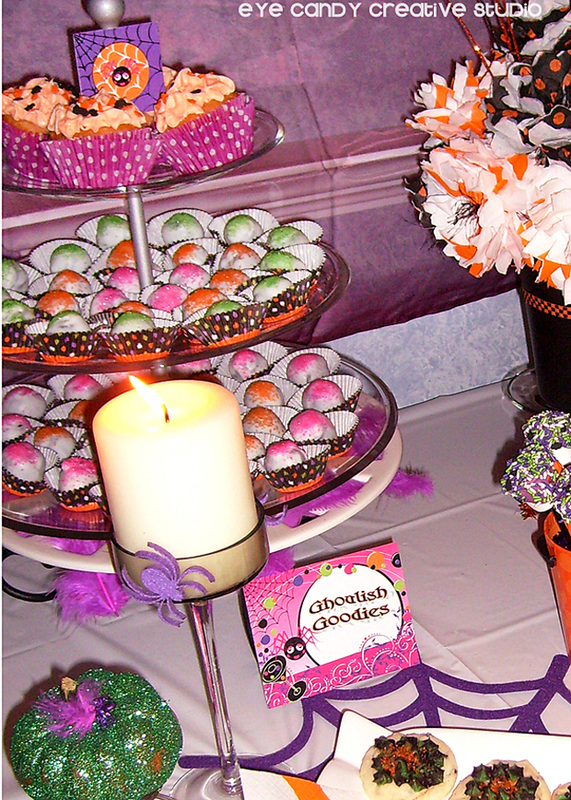 . . (I realllly mean the DESSERT TABLE!=) . 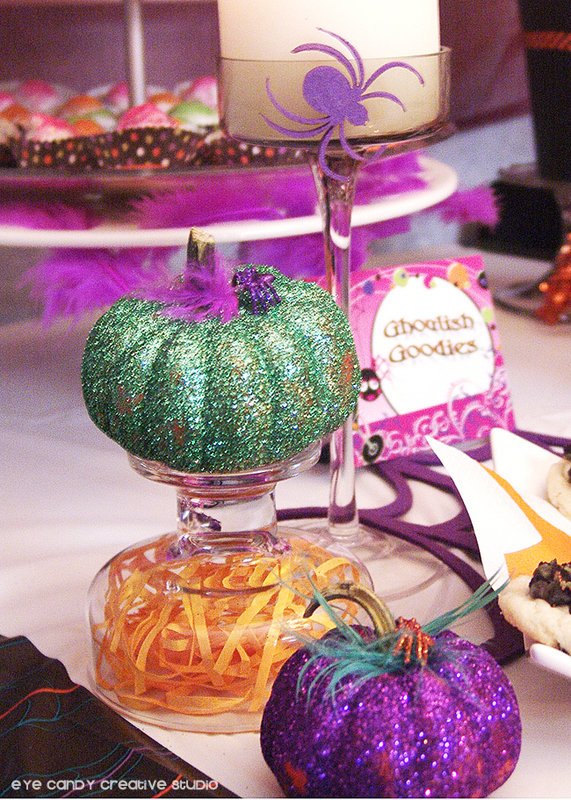 . .
What IS your favorite Halloween snack? 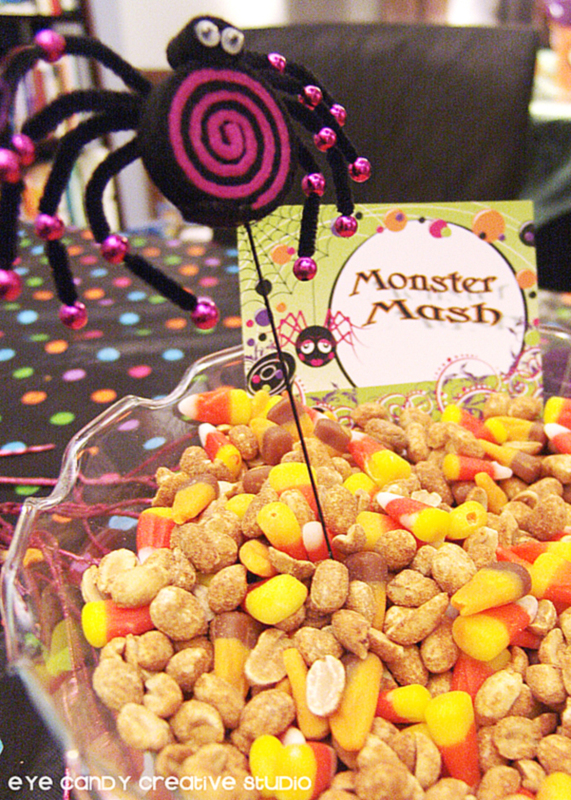 Mine is taking peanuts & mixing them with candy corn - tastes JUST like a PayDay candy bar is you have never tried it. I just tried it for the FIRST time a few years & let's just say I ummm . . .am ADDICTED!!! 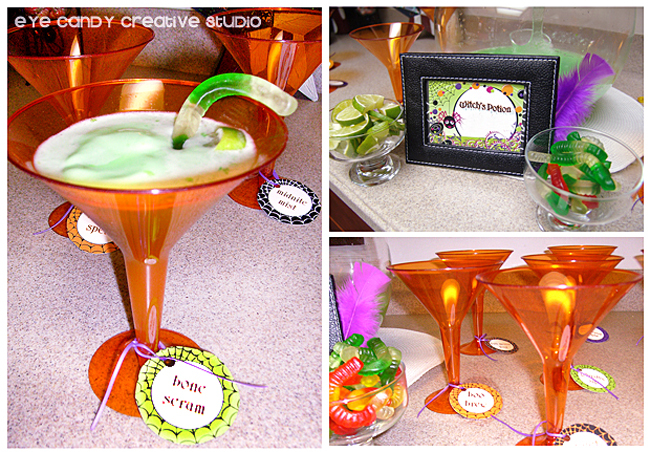 And what's an adult party without some festive FUN drink ideas!? 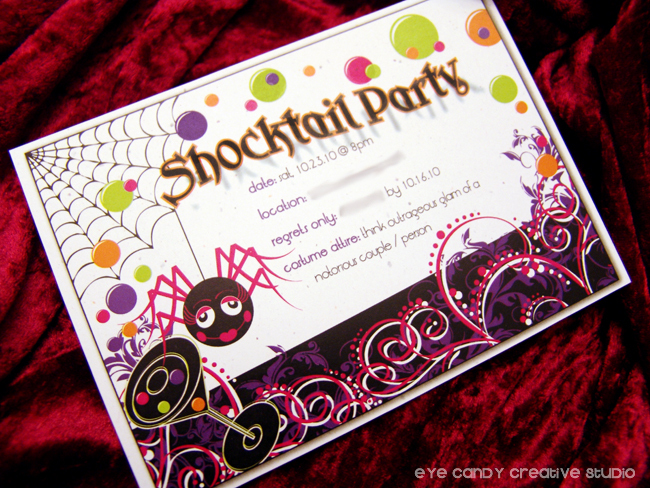 If you have been inspired & you like this collection, I have it available in my shop, which includes the invite as well. 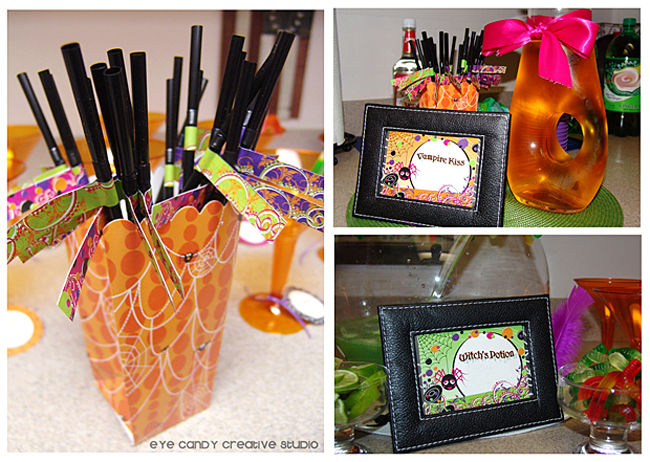 It comes with the invite, toppers, banner, drink flags, napkin wraps, glass/wine labels, food/candy bar labels. Just click here to purchase. I hope you all have fantastic parties this Halloween week & you have found at least one idea to take away from this & incorporate into your own! 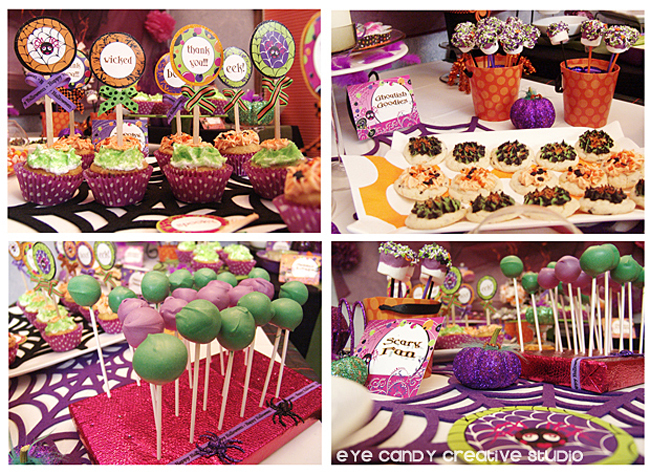 Are you loving the "eye candy" here? Then join me over on Facebook, Pinterest, Twitter & Instagram so you never miss out on an exclusive deal or any behind the scenes photos! I LOVE IT! TOOOOOOOO CUTE AND CREEPY! Love, love, love! Adore all the sparkle! 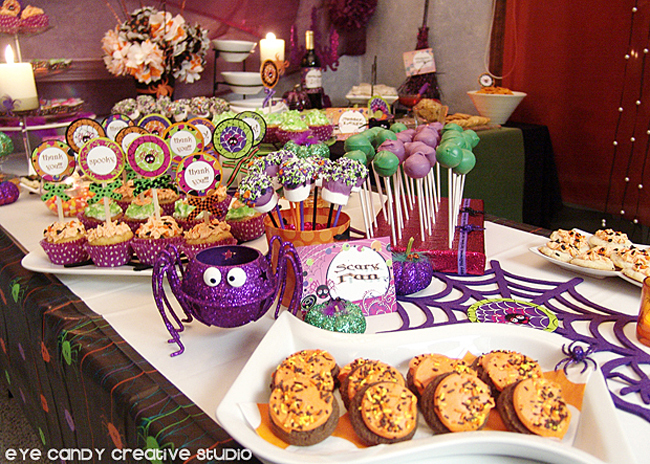 This is the most colorful Halloween Party I have ever seen. Laura has outdone herself AGAIN! ahhh you are so sweet. 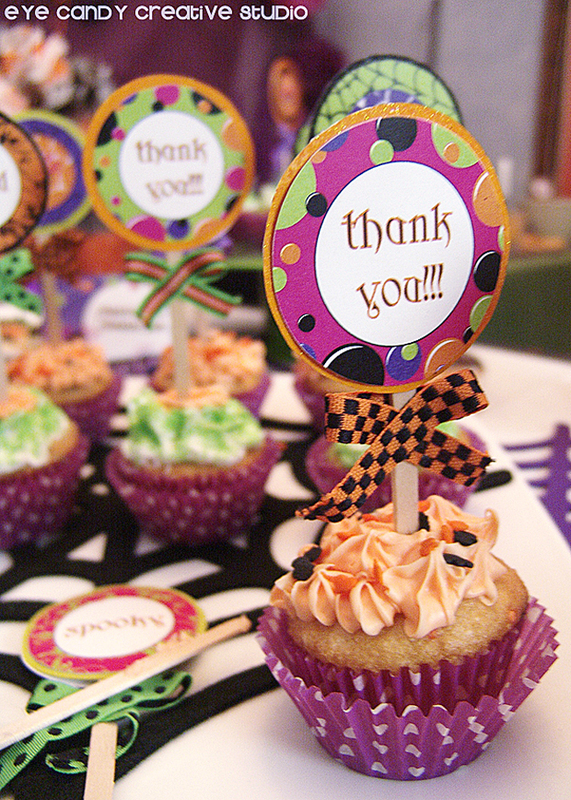 Thanks so much, this is one of the first parties I ever designed and we had so much fun with it. This is so great! You had me at "Shocktail"! Really cute! 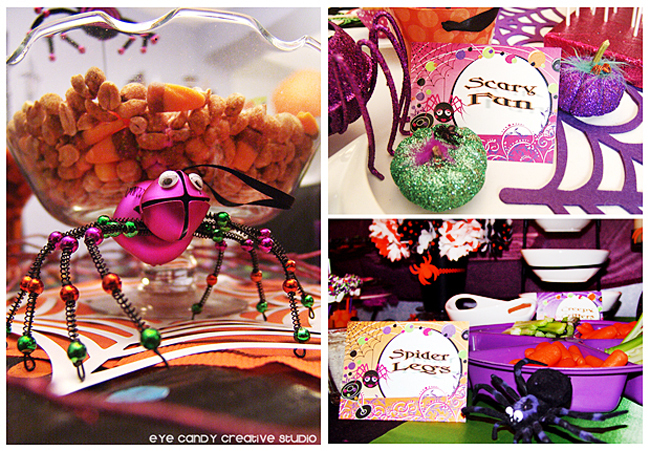 I love how purple has become a new Halloween color -- totally creepy and glam.